In addition to the Galaxy Tab 10.1, one lucky winner will get a T-Mobile G2x, a $25 gift card to spend on Tegra Zone games, accessories or pretty much anything you want and a Jawbone Jambox. 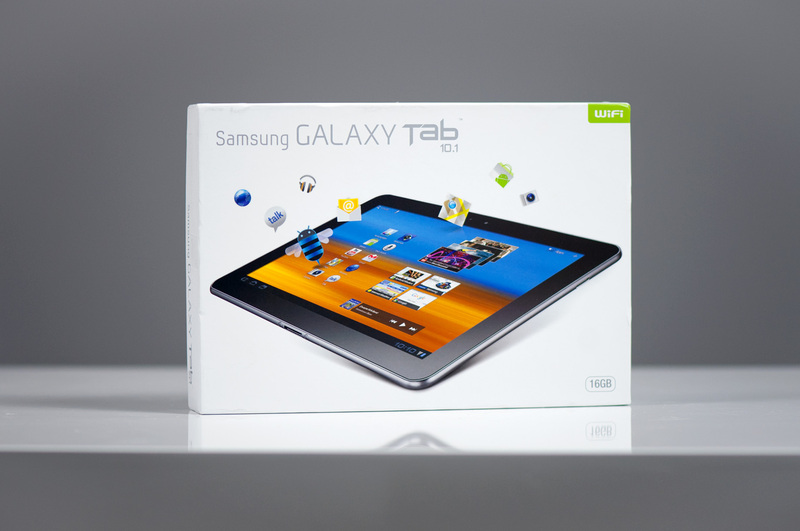 It's safe to say that this is our biggest tablet giveaway yet. Entries will be accepted from 11:50 AM ET on August 18, 2011 through 11:00 AM ET on August 25, 2011. Winner will be selected by August 30, 2011. Upon entering any contest, sweepstakes, or promotion (a “Promotion”) offered by anandtech.com (the “Site”), a website owned and operated by AnandTech, Inc. (“AnandTech”), you must agree to the following Official Rules and Regulations (the “Rules”) as well as any additional rules governing a specific Promotion that AnandTech publishes on the Site. BEFORE ENTERING A PROMOTION, READ THESE RULES AND THE SITE’S TERMS, CONDITIONS AND PRIVACY INFORMATION. BY ENTERING THE PROMOTION, YOU AGREE TO COMPLY WITH THE RULES AND THE SITE’S TERMS, CONDITIONS AND PRIVACY INFORMATION. NO PURCHASE NECESSARY TO ENTER OR WIN. PURCHASE DOES NOT INCREASE CHANCES OF WINNING. Eligibility. Promotions are open to entrants who are 18 years of age or older at time of entry, and a legal resident of the United States (excluding Puerto Rico). Entries are limited to individuals only who are not presently banned from AnandTech’s website or comments section; commercial enterprises and business entities are not eligible. Directors, officers, employees, contractors, and agents of AnandTech (excluding volunteer AnandTech forum moderators) and members of their immediate families (spouses, parents, siblings, and children) are not eligible. Subject to all applicable federal, state, and local laws and regulations. Void where prohibited. Participation constitutes entrant’s full and unconditional agreement to these Rules and AnandTech’s decisions, which are final and binding in all matters relating to a Promotion. Entry Period. Each Promotion will contain a specific time period within which entries will be accepted (a “Promotion Period”). The Promotion Period for this Promotion shall run from 11:50 AM ET on August 18, 2011 through 11:00 AM ET on August 25, 2011. Only entries received during the Promotion Period will be accepted. How to Enter. Each Promotion will describe an entry procedure. AnandTech is not responsible for lost, late, illegible, stolen, incomplete, invalid, unintelligible, misdirected, technically corrupted or garbled entries, which will be disqualified, or for problems of any kind whether mechanical, human or electronic. Proof of submission will not be deemed to be proof of receipt by AnandTech. All entries must be in English. Individuals are automatically entered in this Promotion by signing up for AnandTech’s Comments at http://anandtech.com/Account/Register and posting a reply to this post. If randomly selected as a winner individuals must provide full name, complete mailing address, telephone number, AnandTech user name and birth date within 7 days of being contacted. Limits on Entry. An individual may enter a Promotion once only. The use of any automated launching or entry software or any other means that permits an entrant to automatically enter repeatedly or in excess of the entry limitations is prohibited. Prizes. Winning a gift, prize, or other promotional item (a “Prize”) in a Promotion is contingent upon fulfilling all requirements in these Rules. Winners will be selected in a random drawing of eligible entries received during the Promotion Period. AnandTech will notify Prize winners using the contact information provided in the winning entry. Failure to claim a Prize by the time or in the manner specified in the particular Promotion will invalidate any claim to the Prize. Prizes are not transferable. The odds of winning a Prize or the Grand Prize depend on the number of entries received by AnandTech. TO THE MAXIMUM EXTENT PERMITTED BY APPLICABLE LAW, ALL PRIZES ARE PROVIDED “AS IS” AND ARE NOT EXCHANGEABLE FOR FAIR MARKET VALUE. TO THE MAXIMUM EXTENT PERMITTED BY APPLICABLE LAW, ANANDTECH DISCLAIMS ALL WARRANTIES WITH RESPECT TO THE PRIZES, INCLUDING THE IMPLIED WARRANTIES OF MERCHANTABILITY, FITNESS FOR A PARTICULAR PURPOSE, TITLE, AND NON-INFRINGEMENT. 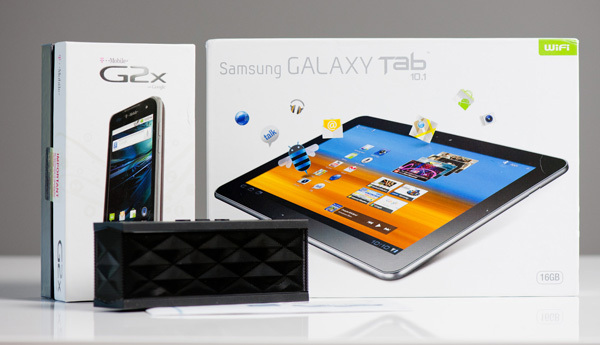 For this Promotion, one winner will be selected by August 30, 2011 and will receive Samsung Galaxy Tab 10.1, T-Mobile G2x, Jawbone Jambox and $25 Gift Card described above (“Grand Prize”). The Total U.S. Retail Value of the Grand Prize is $1200.00. The Grand Prize may not be substituted for cash. The Grand Prize winner will be solely responsible for all applicable taxes, fees, and surcharges associated with receipt and/or use of the Grand Prize. After the Grand Prize winner has been notified and has complied with all applicable Rules, AnandTech will post the Grand Prize winner’s name on this website. Publicity. The winner of a Promotion agrees to allow AnandTech to use his or her name, photograph, likeness, voice, prize information, and biographical information for publicity and promotional purposes without further compensation where permitted by law. Governing Law. These Rules and all Promotions are governed by and controlled by the laws of the State of North Carolina, without reference to the applicable choice of law provisions. All actions, proceedings or litigation relating hereto will be instituted and prosecuted solely within Wake County, North Carolina. By entering a Promotion, entrants consent to the jurisdiction of the state courts of North Carolina and the federal courts located within North Carolina with respect to any action, dispute or other matter pertaining to or arising out of that Promotion. General Terms. Any failure by an entrant, including any prize winner, to comply with any of the Rules or the Site’s Terms, Conditions and Privacy Information may result in disqualification from the Promotion. All entries, whether they are eligible entries or ineligible entries, are the exclusive property of AnandTech. AnandTech is not responsible for any typographical errors in the Rules or in any other communication surrounding a Promotion or for any technical malfunction or error relating to the Promotion. AnandTech reserves the right to amend or interpret the Rules at any time, upon published notice to participants on its website. Promotion participants agree to release, indemnify, and hold harmless AnandTech and its directors, officers, employees and agents from any and all liability regarding the Promotion, including any injuries, losses, or damages (compensatory, direct, incidental, consequential, or otherwise) regarding the use or misuse of any Prize, any event beyond AnandTech’s control resulting in the disruption, cancellation, or postponement of the receipt of the Prize, or any typographical errors or technical malfunctions associated with the Promotion. AnandTech reserves the right to disqualify any entry that it, in its sole discretion, determines (i) to be in violation of the Rules, (ii) submitted by fraud or by tampering with the entry process, or (iii) contains inaccurate or fraudulent information. ANY ATTEMPT BY ANY INDIVIDUAL TO DELIBERATELY DAMAGE THE SITE OR UNDERMINE THE LEGITIMATE OPERATION OF THE PROMOTION IS A VIOLATION OF CRIMINAL AND CIVIL LAWS. IN THE EVENT SUCH AN ATTEMPT OCCURS, ANANDTECH RESERVES THE RIGHT TO SEEK DAMAGES FROM SUCH INDIVIDUAL TO THE FULLEST EXTENT PERMITTED BY LAW. I've really liked using my Android devices over past 18months or so. Recently my company revoked most smartphones and laptops.... including mine. So now I'm shopping for a smartphone and posisbly a tablet for home.